Vacation rental house. 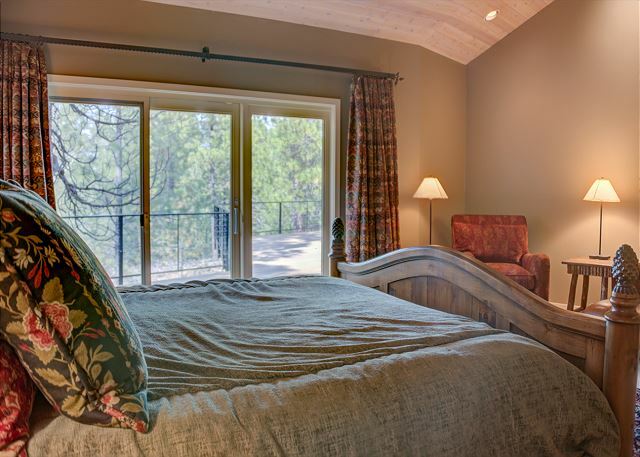 Sleeps 12, 5 bedrooms, 5.5 bathrooms. No pets allowed. 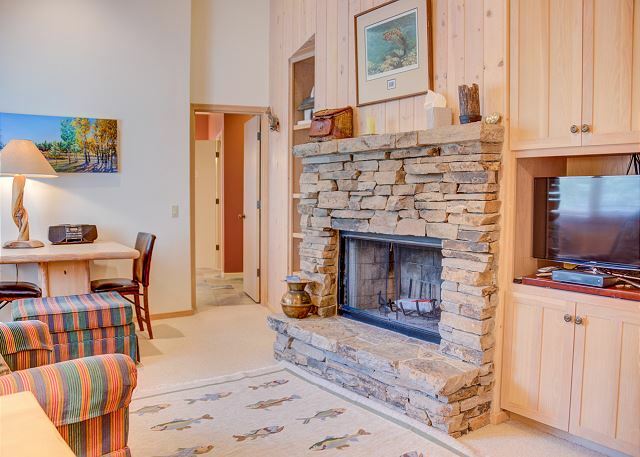 Glaze Meadow #418 is a wonderful vacation home that has too many features to list! This large (4,707sq. 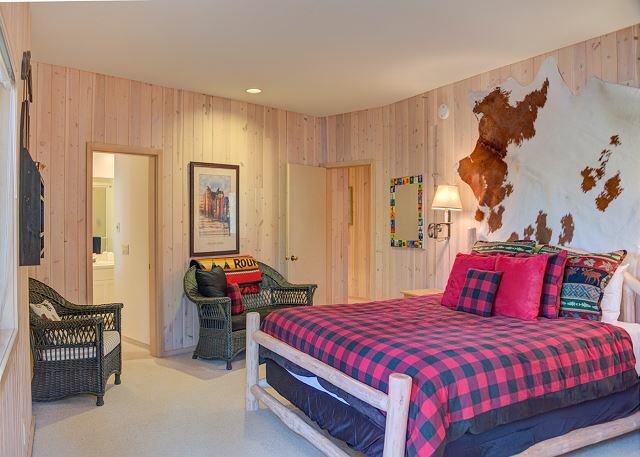 ft.) home is excellent for extended families or groups as each bedroom is private and has its own bath. 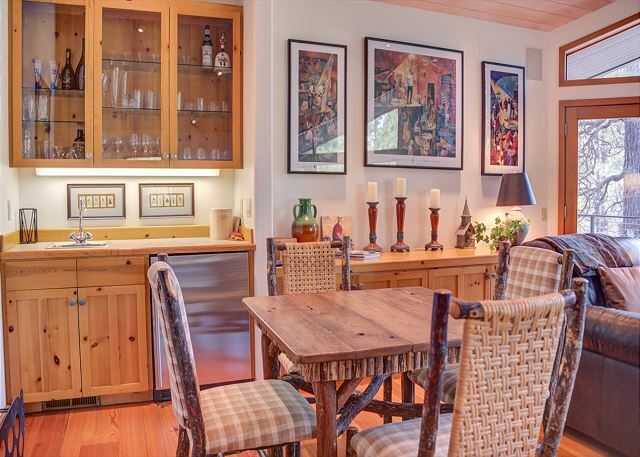 Multiple dining areas are available for those large gatherings and evening BBQ's. There are three separate living spaces that give a great deal of privacy to multiple families. As you enter this executive home, stairs lead up to the living area or downstairs to the three bedrooms, three bathrooms, family and laundry room. There is a twin bedroom and bath on the entry level. 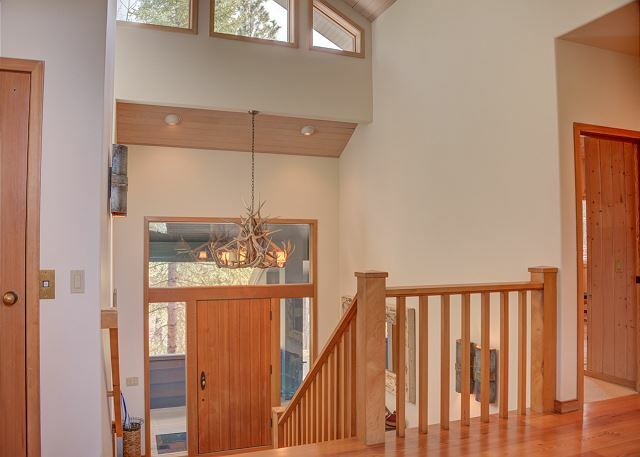 Go up the 8 steps to the massive great room, with its large wood burning fireplace, wonderful sitting area in front of the fireplace, game table, bar and massive dining table with 8 chairs. There is a counter pass-through which looks into the gourmet kitchen which is large and wonderfully equipped with two dishwashers, two ovens, miles of countertops and cabinets and a huge pantry. The kitchen nook has lots of windows and a large eating area with room for 6 plus an eating bar that seats 3. A 1/2 bath is off the kitchen. Down the hallway off the living room on the left is a den with a wood burning fireplace. 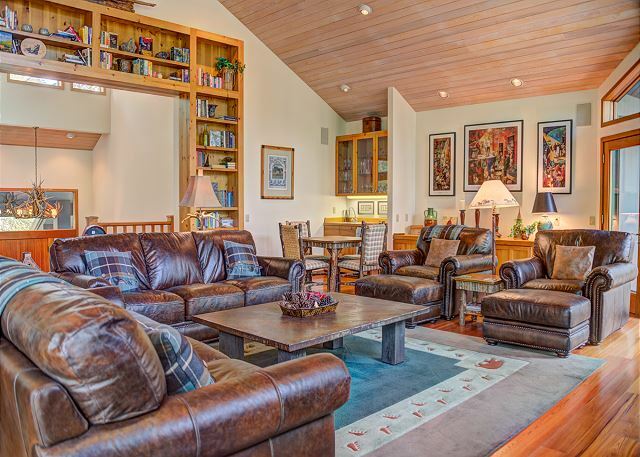 This is the perfect quiet area to read or watch television away from the main living area. Go further down the hallway to the luxurious master suite with it's beautiful large bed, luxurious bed linens and a wonderful spacious master bathroom with jetted tub and separate shower and large walk-in closet. 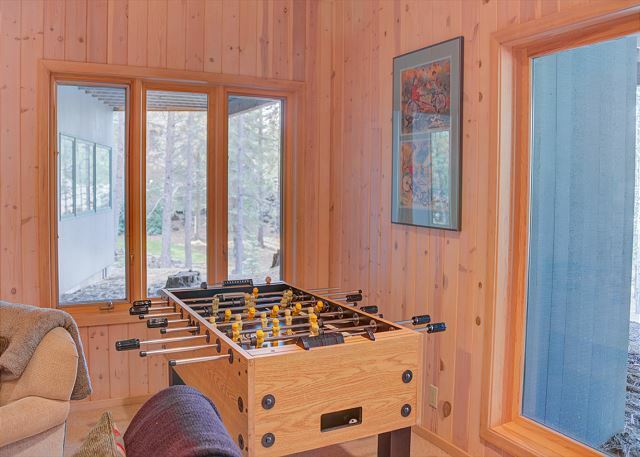 Downstairs leads to the family room with a great television viewing/game area for the kids. 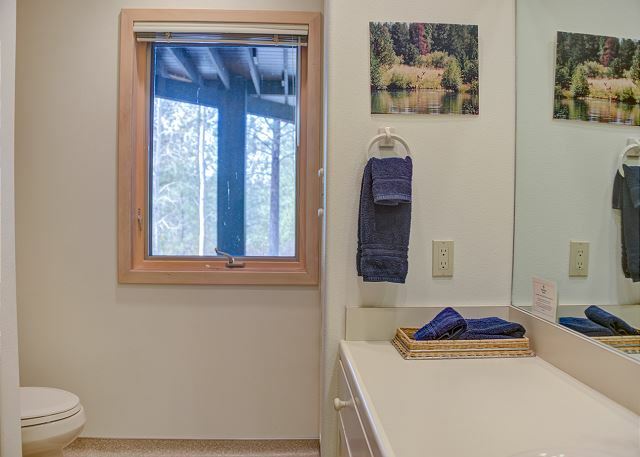 To the left is a laundry room, mud room and large king bedroom with bath with shower. Down the opposite hallway is a queen bedroom and bath and a bedroom with two sets of bunk beds and its own bathroom. Outside the family room is a spacious deck and hot tub. Relax on the wrap-around decks up and downstairs and end your day in the large hot tub. Other features of the home include air conditioning, wireless internet and an elevator. 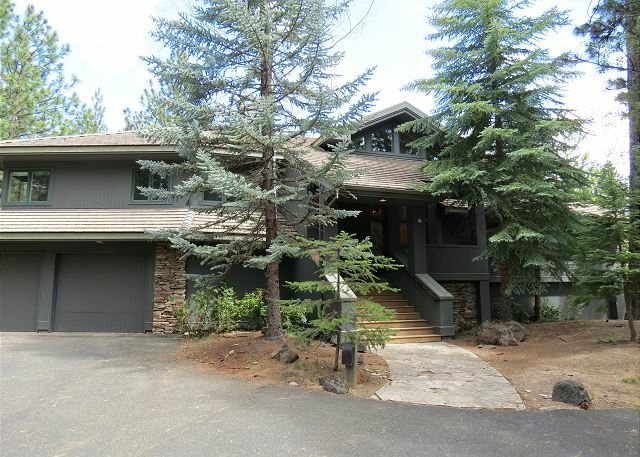 This lovely home is the ideal get-away to make those wonderful Black Butte Ranch memories. Walk to the new Upper Glaze Meadow Pool! Had three generations of family, 13 total (grandkids from 0 - 5, four adult couples) at the house for Thanksgiving weekend. It was relaxing, comfortable and the perfect place to entertain. From the brand new hot tub (and rapid support from Howell's when we had a small issue with temperature setting) to an extremely well-provisioned home (spices, cooking, pool towels, kids toys and books, fire wood etc. etc. ) 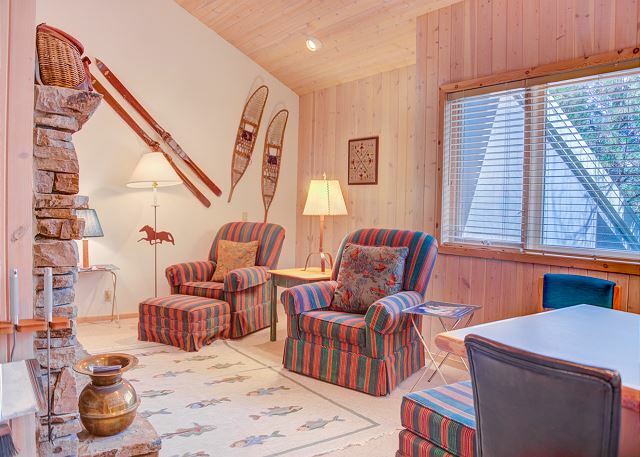 this home stands out far above many other vacation rentals. A lot of times you see a beautiful house and get there and it either doesn't live up to the photos or it is basically empty of necessities. Not here! The place was as comfortable, provisioned and luxurious as if it was your own cabin. My ONLY constructive feedback: adding $8 per person per day BBR fee to the stay seems a bit unnecessary/unreasonable. Given the cost of the rental, it feels like that should be included, it's not the best welcome to pull out the credit card again before being let in the gate. Thank you for your nice review. We are so happy you enjoyed GM-418 and hope that you come back. Howells Co.
Family reunion for 13 adults and 1 child (10 years old) Had a great time Lovely property worked well for us Capacity is listed as for 12, but for three nights we had 14. We took 2 cots and sleeping bags for the extra two. Very positive experience with horse back riding, biking, walking and fishing in the pond and Metoius river. One terrible experience. booked meal for 14 in the lodge as a special meal for the group It was awful. Service was glacial and unresponsive and, some of the food pretty marginal I will never return there for a meal. We really enjoyed our stay at GM418. It has a large living room area we really used for visiting and playing games. The large kitchen was well supplied with all the appliances we needed. Loved the pantry which was also supplied with more appliances. It was nice to have the bedrooms far enough apart that you had a lot of privacy. The hot tub was x-large and well maintained. We loved the house and will be renting it again next year. Our family consists of 4 grandchildren ages 2,4,6,8; 4 adult “children”, the parents of those grandchildren and us the grandparents. The layout of the house with the master on the main floor and two masters suites, bunk room, great room and laundry downstairs is perfect! House is very well stocked. Great kitchen,barbecue,hot tub. We missed the outdoor table this year. We had an amazing time with friends and family at this lovely home. So much space for all the individual families, very clean, full of amenities AND comfortable beds. We would go back in a heartbeat! Everything went smoothly, mental staff was cooperative and helpful, and the home lived up to our expectations. The home we rented was lovely and everything was well prepared for our arrival. Unfortunately the smoke from the fires was a bit overwhelming....even to the point of smoke entering the house when we had the air conditioning on one day. With the babies we had with us, we spent a lot of time indoors to protect their lungs, so we never visited the pool or other places on the ranch. And with all the ash falling we never used the hot tub either. But overall our stay in Glaze Meadow #418 was very comfortable and enjoyable - and the amount of room we had for all of us was perfect. Thank you! Beautiful home & place to stay. The location is a little far back if your doing family resort activities but all eight guys were only golfing and it was Perfect for us. Will try and stay there again when we come back to play the Black Butte courses. This is the third time we have rented #418 GM and we love this house. It is perfect for our family of 7 adults and 4 children, ages 1,3,5,7. It was so comfortable and very well equipped. We love it and will be back. The home is beautiful and was great for our large family gathering. It is a bit far from other resort attractions and often required a drive rather than a walk or bike ride.